Updates are patches and enhancements that repair bugs, replace damaged/missing files, and bring your program up to date. 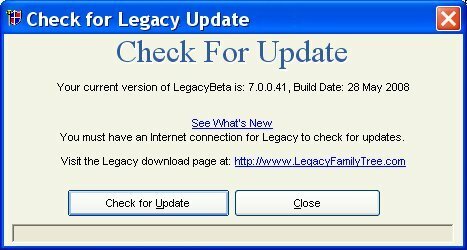 Updating will keep your program in "good health" and will make sure that all of Legacy's many features work at their best. The update process has been streamlined for Legacy 9.0 Deluxe users: They won't need to enter their email address or use a password when updating. You can read the Revision History for Legacy by clicking the See What's New link to open the Revision History page. The update is for both the Standard and Deluxe editions of Legacy 9.0. The updates are always cumulative, which means no matter how many you have missed, the current version will catch you up on all the enhancements and corrections of the past. We recommend that you use either Internet Explorer or Netscape Navigator to download. We recommend a high-speed Internet connection (DSL or cable modem work the best). Dial-up connections frequently experience problems because of the time involved in downloading. Please do not cancel the download (even if the download indicator goes backward) as this will break your Legacy program and you will have to download all over again to fix the problem.